Jí­camas are one of the many Mexican ingredients that luckily, have become readily available outside of the country. Also known as Mexican yams or turnips, they are also a root vegetable. But they are far from the latter in flavor, texture or cooking uses. They are mostly (and as far as I know also successfully) eaten raw. No need to try to cook them, for many of the qualities they are loved for would be lost. They have a similar taste and crunch as the water chestnuts, but in my view, jí­camas are more refreshing, crispy, sweet and watery. Their size varies, and that has little to do with how good they are. You can find very cute baby jí­camas in Mexico, but I haven’t seen them here. From the outside they look like a coconut once the hard green cover has been removed. Their light brown peel is very fibrous and should be removed before eating. Be sure to peel it well or a very thin white layer that is also fibrous and uncomfortable to eat remains there. Inside they are white and appear to be moist, given how watery they are. In Mexico they are an incredibly popular snack, which is very convenient since they are low fat, filled with proteins, filling and easy to digest. They are eaten by themselves or combined with other vegetables or fruits, drizzled with fresh lime juice, salt and dried ground chile, such as Piquí­n, or a chile sauce, such as Bufalo or Valentina, to name a few. They are also a favorite ingredient for salads. Lately, when we have visited Mexico, I have seen sophisticated twists such as vegetarian versions of enchiladas and tacos, in which they are sliced incredibly thin and used as a wrap. When you go look for Jí­camas, choose those hard to the touch and with no signs of moisture on their peel. Once you bring them home, refrigerate them until ready to use. But don’t let many days go by or they will age and become mushy and acquire an unappealing flavor. You know they have passed their time if once you peel and slice them, instead of white, the flesh has become light brown. After they are peeled and sliced, keep them covered in the refrigerator or they will dry considerably. Here it is Saundra: https://patijinich.com/recipe/chayote-apple-and-jicama-salad-with-avocado-and-pepita-dressing/ Enjoy! Pati, what other dressing would be good with the jicama,apple and chayote salad?? Would italian dressing or maybe a sweet dressing like a raspberry vinagrette work well with it? Thank you. Hmmm…it depends on your taste, you should try and see what works for you! I have actually had them with hummas and they are really good. Yes!! Try this recipe for jicama and orange pico de gallo: http://patijinich.com/2012/10/fresh_jicama_and_orange_pico_de_gallo/. It is also great to toss into salads or chopped up with a sprinkle of dried ground chile and a little fresh squeezed lime juice. The link now is: https://patijinich.com/recipe/fresh-ji­cama-and-orange-pico-de-gallo/ I’ll be making this over the weekend for our Super Bowl party. Hi Pati – Love your website! Just what I needed to learn my mexican veggies. 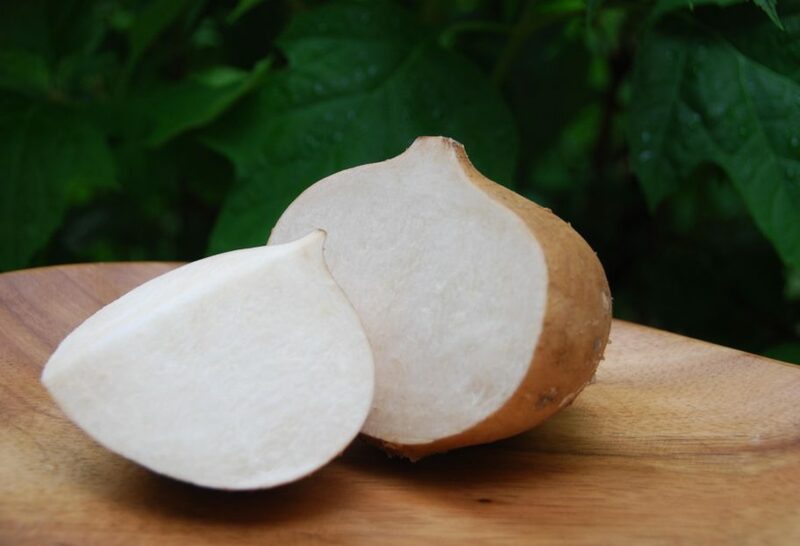 We were just in mexico and I found an awesome root veg to eat, it sounds a lot like what you call Jicama, however the locals called it Jamaica root (pronounced homika). Is this the same thing? I couldn’t find any seeds to buy while I was down there – not even sure if they would grow in our zone (we’re in Canada). Any info on that? Hi Sarah, Thank you for writing!! The root vegetable you found is jÃ­cama!